I am honored to be one of this month's guests for the Hello Holo Customs group on facebook. The brands featured in August are KBShimmer and Lacquester. The pre-order launch opens tonight at 11pm CDT and goes through September 5th. You'll need to be a member of Hella Holo Customs to get the purchase links for each polish. The inspiration images are beautiful! I was able to find the original artist, Furstset, for the 'Holy Tree' image and gained his permission to use it here with credit given, but I could not locate the other artists so I have excluded those images. Descriptions below are provided by the brand and my comments will be at the end of the review. A perfect morning starts with a vibrant sun rising up to fill the turquoise blue sky with its glowing copper gold hue. 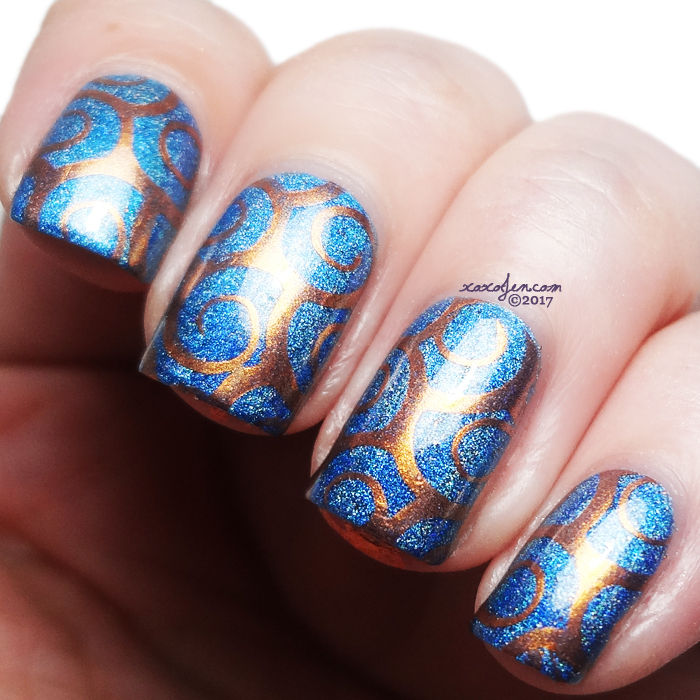 This sun and sky inspired linear holo polish takes inspiration from the vibrant blue skies. An aqua leaning blue color, we accented this strong linear holo with bits of copper and gold for a sparkle even in low lighting. Best in 2 coats. A setting sun softly tints the clouds a cotton candy pink, while crashing waves in a tropical aqua hue lap against pink sand. This photo of paradise has inspired our August Hello Holo custom polish. A softly tinted pink polish features our holo glow flakes. These flakes have a unique holo glow to them in bright lights, while in softer lighting, a turquoise shimmer pops out to say hello. This polish is sheer enough in one coat to layer over your favorite pink cream, but is best in 2-3 coats alone. If you loved our Polish Con exclusive, We Make Your Dreams Come Blue, you will not want to miss this sister shade! Each of these have perfect formula, beautiful packaging and are opaque in two coats. The color descriptions given by the brand are spot on, and I didn't notice any staining on removal. For Polish C I used the foil method for removal to make it a breeze, as it does include tiny glitters. Also launching this evening are the polishes from Lacquester. Join the Hello Holo Customs group on facebook to get the purchase links and see the other three polishes available!